Battery revives in 31 days & extend life by Japanese desulfator ! reason and enhances the battery power. Nanopulser prolongs the battery life. Japan Automobile Federation which is called JAF is the road service system in Japan. It's similar to AAA in USA. This federation releases the road service data every year. 2,793 vehicles are rescued by JAF every day in Japan. The lead-acid battery is in use various purpose all over the world. There are many types of the lead-acid batteries such as car, motorcycle batteries and deep cycle batteries. As you know, basically these lead-acid batteries are not permanent parts. It's a common sense for us that the lead-acid battery should be replaced periodically. However, just a moment please. The lead-acid battery has over 100 years history since it was invented. Probably it had already reached to perfection. In spite of the long history, the lead-acid battery doesn't have a long lifetime. In general, it is said that the lead-acid battery should be replaced every 2 to 3 years still now. Actually the battery might become useless in 1 to 2 years under the hard condition. Although the lead-acid battery has over 10 decades, it has not a long lifetime still now. Why? For instance, nowadays the car parts have a long lifetime. The spark plug has a long lifetime. The radiator has also long lifetime. The fan belts have also long lifetime. The body painting has also long durability. Nowadays, the car parts have a long durability. If the vehicles are checked up periodically, it has over 10 years and 60,000 miles durability. In spite of them, the lead-acid battery has a short lifetime. Why? We have a common sense that the lead-acid battery should be replaced periodically. Therefore, we wouldn't pay attention about the battey life deelply. The truth is that the lead-acid battery has destined phenomenon which makes the battery life shorter. ■Why does the lead-acid battery become useless? In fact, the high quality lead-acid battery has almost 10 years durability. 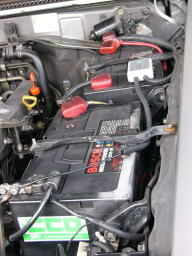 The car battery can work for 6 to 7 years on rare occasions. The fork-lift battery can work for 8 to 9 years on rare occasions. Although it is said that the car battery should be replaced every 2 to 3 years, why can the car battery be used over 6 years on rare occasions? Moreover, what is the real durability of the lead-acid battery? Ok, open the battery box and I show you the element plate of the lead-acid battery below. New element plate The new element plate has a spongy shape. This shape has a large area for the chemical change. Therefore, the new element plate can make the chemical change smoothly. 1. Charging efficiency is high. 2. The battery can save the electricity fully. 3. Discharging power is high. Yes ! ...The lead-acid battery outputs high power. Covered with Sulfation The crystallized "Sulfation"covers over the element plate. Sulfation means the lead sulfate (PbSO4). This substance makes the battery life shorter ! This substance does not carry the electricity. The surface of the element plate has a high resistance by this condition, therefore, the old element plate cannot make the chemical change smoothly. 1. Charging efficiency is low. 2. The battey cannot save the electricity fully. 3. Discharging power is low. No...The lead-acid battery outputs low power. Sulfation makes the battery power down and worse the condition. The starter motor doesn't run well. The power windows move slowly. The head light beam gets dark. The battery fluid tends to evaporate in the short term. The running time is short. The battery tends to heat up. Although the lead acid battery is charged, it does not work well. If the Sulfation problem is resolved by advanced technology, we can prolong the battery life and improve battery reliability. In fact, Japan has an effective technology in order to resolve the sulfation problem therefore, we introduce below. Japanese battery desulfator which is "Nanopulser" outputs the special pulse wave(10,000Hz) into the lead-acid battery. Then sulfation(PbSO4) is resolved into Pb (lead) and SO4 (sulfric acid) gradually. This pulse wave is very weak, therefore, this technology never attack the element plates and it's a safety system for the lead-acid batteries. Sulfation is resolved into Pb and SO4. Then Pb and SO4 ion melt down into the battery fluid. They never deposit at the bottom of the battery. Some of the desulfators vibrate the element plates and remove sulfation, therefore, they damege to the element plates and the battery fluid gets muddy. When the lead-acid battery is charged, Pb ion goes back to the element plates and SO4 ion melts down into the battery fluid. Then 2H2So4(Sulfuric acid) is generated. After that, the acid density of the battery fluid and maximum voltage goes up gradually. Finally the battery performance goes up. Acid density - This means the density of the battery fluid. The new lead-acid battery has 1.28 acid density. The element plates always keep fresh and finally the battery life can extend by Japanese pulse system. The high quality lead-acid battery has a long durability physically. Therefore, the lead-acid battery can work until the last of the element plates and output the stable power. The lead-acid battery can revive and extend the life. The keyword is "acid density". Yes, it's a weight of the battery fluid although this word comes up on the textbook in the school. For instance, "water" density is almost "1.0" and "seawater" is a little bit heavy than the water. On the other hand, the lead-acid battery contains the sulfuric acid (2H2SO4) which is heavy than the water and seawater. The new battery whose acid density is "1.28". So, you can check up the battery condition by the "density tester". Step 1 - Install the Nanopulser to the lead-acid battery. Step 2 - Drive vehicle or charge battery repeatedly. Step 3 - The acid density goes up gradually and it will be properly. This means the acid density recovers to the good condition. If you have a density tester, check it out. Nanopulser was introduced on the "Car goods magazine/2006June". Nanopulser was introduced on the "Eco goods magazine/2006July". Nanopulser was introduced on the "Car goods magazine/2006November". Nanopulser was introduced on the "Car goods magazine/2007March". It has been a month since I installed Nanopulser and the following are my observations on the changes. It was very simple to install the Nanopulser product. I can observe that the battery was improving the next day after installation. This was confirmed after checking the voltage before and after installation of the Nanopulser. Voltage had steadily increased to 12.7v after the third day. This would also mean that I don’t have to use external chargers anymore to maintain battery status. Next I felt that the car had better low end torque and engine response. I can’t think of a more logical explanation except for the fact that maybe the alternator load has decreased due to a more efficient battery. As an added bonus, according to some other car owners, the audio quality from my factory sound system seems to have improved! The Nanopulser device is great! This car has a diesel engine with common rail direct injection design. When turning over the engine, the starter motor has to run a couple of seconds. Moreover being in the northern part of Japan where it’s cold most of the time, it's hard work for the car battery. Then I got myself an OPTIMA yellow top which is a deep cycle battery (AGM). But it has been 3 years since and this battery has experienced deep discharge for over 10 times. Even though this OPTIMA battery can be reused after jumpstarting and charged, there are still some problems with my car. *The car radio station memory will automatically reset itself. *Whenever the engine starts, the CD player initiates the first track available. *The remote control key fob doesn't work properly. *While the engine is idling, the dome lights flickers. *The head lights turn dim. It seems the battery voltage was low. When this happened a few times, I was considering replacing the OPTIMA battery but OPTIMA is expensive for me to repurchase. Then I found this Nanopulser device and decided to try it out. After that I went on a business trip again for about 1 month, came back home and checked the battery again. The LED showed red, but this time my car could start the engine, even after having parked the car for 1 month! After that, I drove a long distance to recharge the battery and the LED turned green. The LED has been showing green till today. The previous problems I faced has been resolved and everything works well now and car electronics stabilized.... the remote control key also works well now. It's great and this takes away the headache of using a charger for me. In fact, I have one more OPTIMA battery which is 6 years old now. This battery has also been successfully reconditioned by Nanopulser so I save money! Hi there. My name is Yuki and I'm a anime artist working in Tokyo. I usually drive around the city in my lovely TOYOTA ESTIMA Hybrid. Even though the ESTIMA hybrid has a Ni-MH battery pack which is durable for extended use, the 12V lead acid battery has to be replaced periodically for optimum driving efficiency. I was searching around for a cheap replacement battery in the internet and I came across this Nanopulser product. If my 12V battery can be reconditioned by this device, then I feel it is a great bargain, isn't it? So I ordered a PG-12S and it was delivered to my home the next day. I think High Grove and our local logistics is simply great! When I asked my husband if he could help me install this new device, he said he could do it for me over the weekend. But I was eager to have the new product installed as soon as I can, so I decided to fix it myself. After that my daughter started crying so I took care of her for an hour in the house. Following that, I returned to the car for checking and saw there was no light from the LED. I then cranked the engine and it started smoothly and the air conditioner was working stably! It seems the Nanopulser is beginning to have effect on the battery now. I feel this device should be installed on all car owners’ batteries. TOYOTA Land Cruiser has two batteries connected in series (24V). It's been 100 days since I installed the Nanopulser, and I find the battery condition getting better and it's easy to start engine. I feel this is a good device. These batteries have been in service since one and a half years ago. One battery measured 12.2V, which indicated required charging. The other one was measured at 12.5V. When the engine was killed, PG-24S didn't work because of the detected low voltage. After installation, I drove 300 km. The indicator changed into green, but stopped. I measured voltage at 12.3V for one battery. After 45 days, I found some changes. The battery voltage is always over 12.5V and the indicator showed green. Moreover PG-24S continued working even after the engine was killed. It's easy to start the engine now and I feel that the low end torque has improved. Now both batteries output 12.8V individually. It took a while to recondition the two batteries because these batteries had low power and too much sulfation to start with. If I had chosen to replace these batteries at the retail store, it would have cost me ¥60,000 (US$600). I really appreciate this device which works and has cost benefits to me. I have just ordered another two more Nanopulsers. One is for my second car and the other is for my friend. These batteries have been working for the last three years and I felt that they were having low voltage at the end of last year. I use this truck daily on the job, so the batteries are constantly working hard in harsh conditions. If I wanted to replace these two batteries, the cost would have been well over ¥40,000 (US$400). Therefore I browsed over the internet looking for batteries when I saw this "Nanopulser" product. I had used a chemical addictive for the lead battery before, but I felt it was more of a placebo effect. I was wondering if Nanopulser could be the same. I was thinking of replacing my two batteries at the car parts store on February when they start their season-end sale but my car radio unit and the power windows suddenly stopped working…. Then I remembered the Nanopulser device at that time. It was within my budget to buy it and if the owners' testimonials are indeed true, then my battery problem can be solved as well! Finally I decided to order the Nanopulser PG-24S. Installation was easy but my batteries were dying and almost flat. When I started engine, the starter motor didn't run. Initially, I was disappointed....but I changed my mind and prepared the electric heater to heat up the batteries as it may have been frozen. After 2 hours, I tried again and the engine could start, however, Nanopulser LED didn't work I think because of the low voltage reading. I tell myself "It is a good sign and never give up!" After 3 hours of engine idling, the LED started blinking (Yahoo!). I stopped the engine after that. The next morning, the engine could crank start even though the temperature was -3 degrees the night before! Nanopulser had only been working for only 4 days but I observed that the battery voltage has gone up and continues to improve even after that (awesome!). I have introduced this device to my friends and I feel that truck manufacturers should adopt this device at their factories. Even though I think it's not easy for them to include Nanopulser for their trucks, I remain hopeful they will. *Above owners installed Nanopulser to the normal batteries properly. If the lead battery is physically damaged, Nanopulser cannot work properly. The lead-acid battery can revive & extend the life! *The acid density goes up by driving (charging the battery) repeatedly. Not all lead-acid batteries can revive and extend the battery life. Of course, this Japanese technology cannot work well on the physical damaged batteries. Would you give us your understanding, please. ・The element plates are damaged under the lack of battery fruid. ・The lead-acid battery gat a shock physically and element plates and separators are damaged. ・The element plates and separators have physical problems such as corrosion, collapse and short-circuiting. Enhance the battery power and extend the battery life. M.F.L./Multi Function LED shows the real-time battery voltage. Nanopulser outputs special pulse wave into the lead-acid battery. Frequency is 10,000Hz. Evo.5 - Built-in 2 types A.C.O. Nanopulser PG-12S(N) and PG-24S(N) with a built-in A.C.O. (Auto Cut Off). All Nanopulser series are assembled by NNP electricity co., ltd. in Shizuoka Japan. Q1: Can I charge the battery with a Nanopulser by the charger? Q2: Can I use the quick charger with a Nanopulser? A1: You can charge the battery with a Nanopulser. It doesn't matter. A2: Although it doesn't matter for the Nanopulser, the lead-acid battery will be damaged by the quick charging. Basically we don't recommend it for the lead acid battery. Can I feel any change after installing the Nanopulser? We have been having the impressions from the owners who say that the starter motor runs easily by the Nanopulser. Which type is the best selection PG-12S ore PG-12N for the 12V starter batteries? We recommend PG-12S for the 12V car and motorcycle batteries. Some of the trucks have 2 batteries on the side of the body. Can be the Nanopulser installed on the batteries? I'm worry about the water and dust. It doesn't matter. Nanopulser is water-proofed. I have some lead-acid batteries in my garade. I'm going to remove Sulfation by the Nanopulser and charger. Which type is the best selection "S" or "N"type? "N" type is better selection because "N" type is a wideranging model. I have a question about my campervan which has 2 deep cycle batteries in parallel. Which type should I select? I'm interested in the history of the battery desulfator. At first, the battery desulfator was invented in US over 10 years ago. However it outputs strong pulse wave into the lead-acid battery. This system removes Sulfation by the strong pulse wave in a short time, it has some problems for the lead-acid batteries. ・The element plates might be attacked and dameged by the strong pulse wave. ・Removed Sulfation deposit at the bottom of the battery. ・This system consumes high current and outputs system noise. As you know, the lead-acid battery consists of the element plates which are made of lead. Lead is a soft metal, therefore, safety system was invented in Japan.